John Buckley began his journey in martial arts in 1986. He walked into Grandmaster Richard Lee’s East-West Kung Fu School in Alamo, California, and immediately felt like he was at home. His first meeting with his teacher confirmed that he had found something very special. Mr. Buckley immediately dedicated himself to Bok-Fu-Do and quickly became one of the top students in the school. In 1989, he made an important decision to enter into the subject full-time and became the first to commit his life to following in the footsteps of his teacher, Grandmaster Lee. He quickly achieved his black belt in 1991, but that was only the beginning for Mr. Buckley. Master Buckley’s competition experience is extensive. He has traveled all over the globe to compete with some of the best Chinese martial artists in the world. Mr. Buckley has represented the United States in world and international competitions including: The 7th and 8th World Kuoshu Championships in the Republic of China (1992 and 1996), London (1996), Brazil (1995), Fourth Asia Cup, Hong Kong (1991), and 1st American Cup, USA (1991). In 1989, Mr. Buckley was one of four people in the first group of students that Grandmaster Lee sent to the National Kuoshu Championships in Baltimore, Maryland. Hosted by Grandmaster Huang, Chien-Liang, this tournament is regarded as being one of the most prestigious Chinese martial arts tournaments in the world. By chance, one of Grandmaster Lee’s students had come across an article in Inside Kung-Fu Magazine announcing Grandmaster Huang’s 2nd Kuoshu Championships. Grandmaster Lee remembered Grandmaster Huang from their first meeting at the 1975 World Kuoshu Championships in the Republic of China. Although they had not spoken since, Grandmaster Huang invited Grandmaster Lee to bring some of his top students to the tournament that year to try out for a spot on the National Team that would go on to represent the United States in the 6th World Kuoshu Championships in Las Vegas later that year. With only three other teammates, Buckley went on to represent his teacher and the system at the national tournament. Master Buckley is a pioneer of the Bok-Fu-Do system. Since that first small group in 1989, each year the team that travels to the national tournament in Baltimore has grown. Now the West Coast Team consists of well over 100 people, much to the delight of Master Buckley. This impressive team is in a large part due to his leadership and example. He has been the head coach of Grandmaster Lee’s West Coast Team that has won the overall team grand championships at the International Kuoshu Championships in Baltimore, Maryland, eleven years in a row (2001-20011). While Master Buckley’s accomplishments and martial arts ability are remarkable, what is more impressive is his ability to influence the students of the system. He has affected the lives of thousands of students in a positive way. He has consistently encouraged the students to gain tournament experience, to obtain their ranking, referee status and certifications through the international governing bodies, in an effort to help them to better their understanding of the martial arts. Now past the competition stage, Master Buckley has dedicated himself to producing the highest quality martial arts students. He has coached students that have become national, international and world champions. In 2003, Master Buckley followed in the footsteps of his teacher, Grandmaster Lee, when he was selected as the United States Kuoshu (Kung-Fu) team’s head coach for the World Kuoshu Championships in Brazil. Out of the seventeen member USA team, eight were from Grandmaster Richard Lee’s East West Kung Fu School in Alamo, California, and trained personally by Master Buckley. The United States team did remarkably well overall with a 2nd place finish, behind only the host country of Brazil. In 2006, Master Buckley was chosen for the second time to coach the US team. The team had their best performance ever and for the first time took the gold medal in the overall team standings. As in 2003, eight of the seventeen US team members came from Grandmaster Lee’s school. The entire United States Team came away from the Singapore world tournament with seven world champions, five of which were personally trained by Master Buckley. In 2009, Master Buckley coached the USA team for a third time at the World Championships in Germany where the team defended their title and again took the gold medal. Richard Lee’s East West Kung Fu again had 8 people on the team and 7 of them came home as world champions. 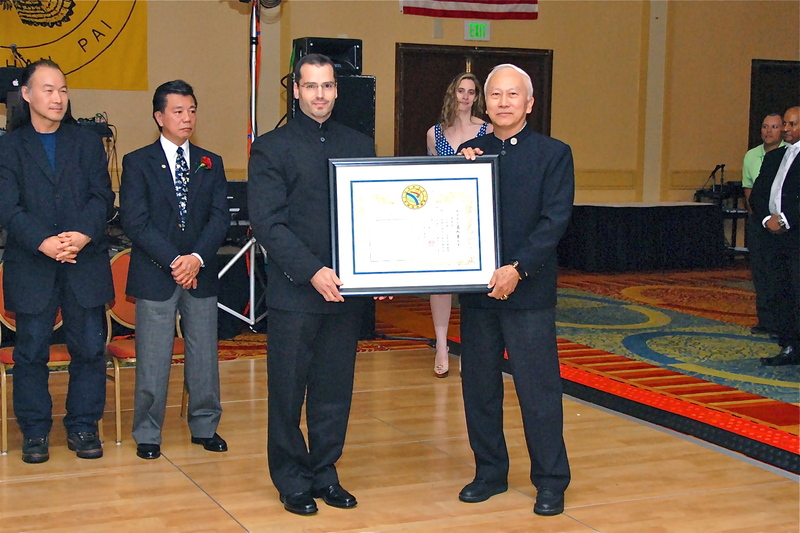 In 2003, Grandmaster Lee celebrated a tremendous milestone in his martial arts career. Master Buckley was honored to be able to document that milestone by writing and compiling a 50th anniversary book in honor of his teacher. This incredible book had letters of congratulations from not only colleagues, students, and some of the best martial artists from around the world, but also many of the most well known political figures of our time. Master Buckley also helped Grandmaster Lee put together the three foundation books of the Bok-Fu-Do System. In addition, Master Buckley has published his Master’s Thesis that was written in the process of becoming a Master in Bok Fu Do. Master John Buckley is a first generation disciple and the first disciple of Grandmaster Richard Lee. He currently holds the rank of Sixth Degree Black Belt in Bok-Fu-Do and Seventh Tuan in Chinese Kuoshu. He is an international certified referee ‘A’ for the World Kuoshu Federation.